Coil heaters will happily operate at temperatures up to 750˚c and will do so in the face of severe abuse such as a deluge of molten plastic or mechanical damage, which would almost certainly destroy the equivalent mica-type heater. We stock a comprehensive range of elements manufactured to CE approved quality. The elements are stocked in straight lengths, so they can be formed to customer specification on a rapid turnaround. Our policy is to hold comprehensive stocks of straight elements in various lengths and loadings, so that we can form and complete heaters quickly. When ordering please specify Internal Diameter X Width you need. We will also require the termination style as per the codes above. Please advise voltage and wattage (standard 230v) and required lead length. Also advise if you require a tight wind or even spacing between coils. 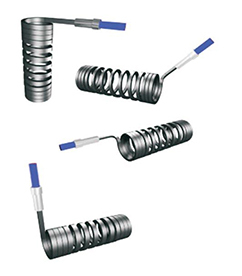 Coil nozzle heaters have been designed to meet the continually growing demand for a hermetically sealed heater, that can operate at the increased temperatures required by new equipment. The sealed tubular design combines flexibility for design with strength and durability in operation, giving it many advantages over other standard mica nozzle heaters. Working temperatures up to 750° C give the coiled heaters a greater temperature range and more importantly can last up to 10 times the lifespan of a standard mica nozzle heater, saving down time and maintenance costs and reducing the number of heaters used. We can offer miniature coil heaters at competitive prices.